『Animeta!』 is a must read for those who wish to discuss about the problems of the animation industry. Hello everyone. My name is Kazuya Masumoto, and I am an animation producer at studio TRIGGER. Today I would like to discuss about 『Animeta!』 A series currently published on Morning two by Kodansha. The animation industry in Japan started with 『Astro boy』in 1966. The entire industry is based on a closely-knitted and isolated foundation. Creating 30 minutes of animation consists of 200 to 300 individuals working together. And yet, the episode does not fail to deliver the director’s creativity and fetishism to the viewers. One can say that the procedure to create Japanese animation is a perfected system to an extent. However, because the industry relies on such small foundation, it is currently confronted with a big turning point. With the rising demands in quality the industry must cope with numerous issues such as the staff’s exhaustion, budget deficit, labor problem, and the lack of workforce. The shifting values of the industry has also made an effect to the business model of the industry as well. The multitude of problems simply surfaced as animation became more mainstream. While the current condition may sound negative, it is in fact a great opportunity for our industry. Often times these problems aren’t even recognized in other industries. It may be due to the fact that the particular industry is perceived to be bland or uninteresting. Regardless of the fact, we are fortunate that the mass is concerned and interested in ours. This movement will definitely help establish the future of our animation industry. In order to establish a better future, we must first acknowledge the current conditions of our industry. It’s easy to point out a problem. It’s also easy to be hopeful of the situation. Anyone can do that, and it simply does not remedy the situation in most cases. Then what can we do? What actions can we take? It’s not easy to have a clear vision and an agenda to execute that goal. Again, one must first understand the current industry and its problems to effectively take actions for improvements. So, how can one learn about the industry? How do we inform ourselves? 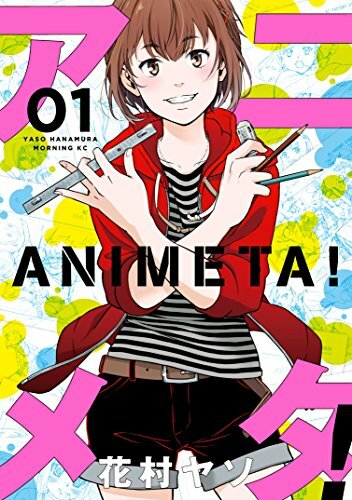 I would like to introduce『Animeta!』a manga series that depicts the current working conditions of our industry in a very sports drama-like method. However, what I want my audience to understand is not plot nor the details of this series. It is the character's ideal and their passion expressed to their work is what should be recognized. What does it mean to create an animation? What differentiates the film from a merchandise to artwork? What does it mean to deliver a finished film to the audience? Through『Animeta!』the reader can indirectly experience our industry through the perspective of a production staff. By understanding not only the pain, but the joy of creating animation, I hope that the series will provide the recognition and understanding the industry requires. Animation cannot be created by ideals alone. At times, we will need to get our hands dirty as well. However, I strongly believe that the industry is unique of its kind and deserves our attention. I'm personally a fan of Yuiko Fuji! A positive feedback definitely leads to the happiness of the creative staffs. Also, TRIGGER is currently producing 『Darling in the Frankxx』with A1Pictures. It is currently available on both television and streaming so please do check it out! Please do check out　darli-fra.jp/　for more information!